World champion Al Dunning and nationally-known clinician Ken McNabb will go head to head June 11-13 at Colorado State University’s Equine Center in Fort Collins, but this time as coaches. Leading two teams during the Extreme Team Mustang Makeover, Dunning and McNabb will offer their training expertise to each team of 25 trainers from across the country that will be competing for $12,500. Like previous Extreme Mustang Makeover events, trainers picked up their randomly selected wild horses about 90 days prior to the event. There is no entry fee for the event and trainers will be reimbursed up to $700 in expenses. See the list of accepted trainers here. Trainers will be “drafted” at the event to the American League by Dunning of Scottsdale, Ariz., and the Patriots League by McNabb of Cody, Wyo. 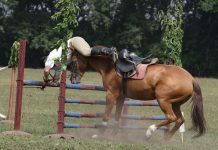 Trainers will compete in entry level reining, trail, and cow work from rules adapted from the American Stock Horse Association and the Stock Horse of Texas Association. Points will be earned individually and for the team by each trainer, with each coach selecting three trainers per competition element who points will count for the team, as well. “Another great element to this competition is that fans are going to be able to vote for their favorite trainer through a bracket system on line,” said Colbert. “The People’s Favorite trainers and mustangs will then compete on Friday night of our competition during a Mustang Smackdown for cash and prizes.” Top Ten finals will be held Saturday June 12 at 7 p.m. for individual qualifiers while both teams will compete in a team performance designed by their coach. All mustangs competing in the competition will be made available for adoption June 13 at 10 a.m. The event is free to the public with the exception of the Saturday night Top Ten finals performance. 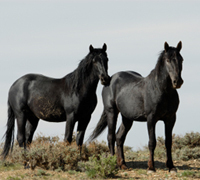 The mission of the Mustang Heritage Foundation and the goal of the Extreme Mustang Makeover are to increase the placement of mustangs across the country into good homes that are currently housed in facilities managed by the Bureau of Land Management. The Mustang Heritage Foundation created the Extreme Mustang Makeover event to showcase the recognized value of mustangs through a national training competition. I wish they would have an amateur version. I’d love to enter. I hope this brings the message that Mustangs are not only trainable but versitile too. Lets also hope that all the Mustangs are adapted!!! The slaughter house is not the place for part of our Heritage.